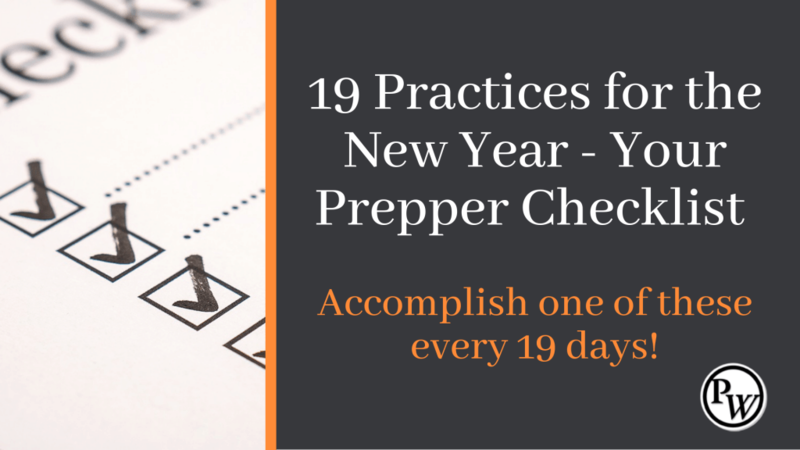 19 Practices for the New Year – Your 2019 Prepper Checklist for Getting Your Family Prepared! Accomplish one of these every 19 days! The new year symbolizes a new start for many people. New Year’s resolutions are plenty on January 1 but usually go out the window by mid-February. Many goals are thrown to the side and forgotten because there isn’t a plan to help measure progress throughout the process. Another reason goals and resolutions fail is that people lose interest. Well, what could be more interesting and valuable than getting your family prepared? 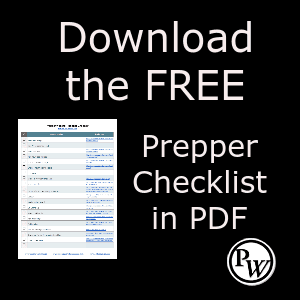 This article and accompanying free 2019 Prepper Checklist download will help you get started the right way! The following 19 goals can be easily spread across 19 days each. That means a new focus every 19 days, so you don’t get bored! That’s doable, isn’t it? So let’s look at 19 practices that can help get you and your family better prepared in 2019. NOTE: The dates reflected with each practice will need to be adjusted for your location and season. The practices are fluid and should be adjusted to meet your needs. The dates however, are approximate and will reflect a 19 day cycle. You need a budget! I should just stop there and move on to #2, but some of you aren’t convinced yet, because you don’t have a budget! Here’s the thing, If you don’t tell your money what to do, it will do whatever it wants (kind of like kids). Your money will leave your pocket faster than you know what happened. It happens a little at a time. You buy a soda here, a candy bar there. Don’t try to manage your monthly budget, your bills, savings and all of that in your head. Put your budget down on paper so you can see all the relevant categories you spend money on. Then, you can track what you spend money on and adjust accordingly. Be sure you add a category for preparedness too! Related: How to Get Your Finances Under Control So Your Family Is Financially Prepared for An Economic Storm! Murphy will come and visit you! That is for certain! When he comes, he usually costs some money. But you want to send Murphy packing, cause you don’t want him to move in with you! The best way to do this is to have an emergency fund. An emergency fund will take the stress and pain away when something breaks down, your car won’t pass go, you have an unplanned visit to the dentist for a cavity, or the washer machine isn’t draining. You know how this goes. Having an emergency fund allows you to just pay to get whatever fixed and move on! Don’t be like the rest of America who can’t afford a small hiccup in their finances. Get this done! Ok. To round-off our financial category, you need to pay down debt. In an environment that is uncertain when it comes to the economy, you don’t want to have debt hanging over you. You don’t want debt in any economy actually! Debt causes you from having options. You will always be tied to a job so you can manage your debt. What if you were offered another job, your dream job, but it paid a little less? If you’re saddled with debt, you couldn’t take it because you needed all the extra dollars to pay down the debt you acquired. Start Dave Ramsey’s Debt Snowball. Pay the minimum on each debt and focus everything you have left over on the smallest one (regardless of interest rates). Once you pay off one, throw all the extra money at the next smallest and so forth. If you can do that, without acquiring more debt, you will be free of the hold that debt has in your life. It is the greatest feeling! If you haven’t started your food storage, then stop messing around and get it done! Food is important. Just think for a second, if the big one happened right now, how long could you feed your family with what you have in your pantry? Are you ok with that amount? Food storage can seem like a daunting task! But it doesn’t have to be! Start with a one-week menu of things your family will eat for 1 week. Try to only use items that don’t need refrigeration. Once you have that one-week menu, multiply it by 4 and you have 1 month worth of food. If you want more variety, make a second menu and alternate the menus each week. It’s that easy! If you already have food storage, you can take this time to do a quick check and see if it is all safe and no pests have compromised your packaging You can also check to see if anything needs to be rotated out and replaced. Related: Enroll in a FREE Food Storage Video Lesson – CLICK HERE. So no joke, you need water! You’ll die if you don’t have water a lot sooner than if you didn’t have food. You need to store water and have water filters on hand. I personally like waterbricks, but you don’t have to purchase those to have water storage. You can do this frugally by using 2-liter bottles. Gather 2-liter bottles from family, friends, and neighbors. The holidays, parties and cookouts are the best time to do this. Tell them you are doing some “plastic projects” so you don’t look weird (tip – check Pinterest real quick for some ideas just in case they pry – you know Aunt Susan will!). Wash out your saved 2-liter bottles really well. Mix a solution of 1 teaspoon of non-scented bleach to 1 quart of water, put the cap back on and swish the solution around in the 2-liter bottle real good to sanitize it and kill off any bacteria. Let the bottle air dry. Fill-it-up and store it away in a cool, dry place away from sunlight. Some recommend putting bleach in the 2-liter while you store it. You can do that if you want to be extra safe, you non-live on the edge person you! Cooking from scratch is not only a great skill to have, but it will also save you money! Take some time to try some basic recipes and move from there to more complex ones. The key here is planning your menu and getting all the ingredients in one trip to the grocery store so you don’t have to stop every day. Cooking your own food will also allow you to have more say as to what you put in your body. You can cook healthy food and not eat so much processed junk. If you need some recipes, the internet is a wealth of knowledge for you! Related: The Prepper Website Archive for Recipes – here and here. Planning is one of the most important things you can do to get you and your family better prepared. The fact is that many don’t purposely plan. This is understandable because planning for preparedness, with everything you might read, can seem daunting. What can you learn to make life a little bit easier if you were in an emergency situation? We have already discussed cooking from scratch. But, have you thought about other skills? What about starting a fire, sewing a patch on clothes, tying a few useful knots or preserving food? We live in a time where so much knowledge is available to anyone who wants to learn. The more you know and the better your skills, the more valuable you are to your family and others, not only in an emergency situation but in the overall quality of life. Starting a side-hustle, micro-biz or whatever you want to call it, is a great idea for the new year! The extra money that it brings in can pay down debt, build your emergency fund or even help purchase your preparedness supplies. Being in a better financial situation should be a priority for everyone who is preparedness-minded as we all know the economic fundamentals in this country never were corrected. We have a ton of debt and at some point, it will need to be paid! The question when the topic of a micro-biz comes up is what kind of micro-biz should one start. The answer is simple. Do something you love: craft, organize, teach, haul something, there is really no limit. The key is to offer something that others will want to pay for! Believe me, there is something that you do that others will be willing to pay for! This is not necessarily a skill to learn, but something to unlearn. We have become accustomed to going to work, coming home and sitting in front of the TV to veg out before we go to bed. We can spend countless hours in front of the idiot box just wasting away. Those hours can be used to do something valuable. Think about all of the hours that you have spent in front of the TV and how all of that time could have been used for something more valuable? Could you have learned how to paint, craft, woodwork, write a book, take classes or something else that would have added to the quality of your life? Don’t get me wrong, TV isn’t bad. But don’t let it become the thing you do for 2-3 hours a night, everynight. Gardening will take you longer than 19 days, like most of these practices. But you can definitely start planning and get your space ready. Gardening is a skill that you need to learn and develop. It isn’t as simple as putting some seed into the ground and then waiting for your harvest. Plan out where you want to place your garden. Where do you need to place it to get enough sun? How will you water your garden? Will you do it manually or will you set up a sprinkler system? What will you plant and how long will it take for you to harvest your vegetables? Where would you get your seeds? Gardening is a great stress reliever. It can save you money. It can be a great family activity and will provide you with skills that you need if the poop ever hits the fan! Medical supplies are something that every prepper should stockpile. And, medical supplies are like wood when you’re building a fire. Once you think you have enough for the night, then you double it. But you can’t take a closet full of medical supplies with you. You need to have a kit that you can take with you when you leave the house. There are various types of medical kits that you can build. Some kits are worn by concealed firearm carriers in case of a wound. Others have kits that are stored in their vehicles. Some preppers even have kits that will go with them when they travel. Whatever kit meets your needs, don’t settle for a cheap $9.99 kit from a big box store. Take the time to get the items you need and put them in a kit that will be valuable to you in a scenario you might find yourself in. There is nothing like spending a few nights out in the woods with your family. Purchasing a tent, some cooking supplies and a spirit of adventure can make for a great inexpensive family trip. Camping is also a time to do some stealth preparedness. You can take the time to teach your kids how to build a fire, how to cook over an open fire, how to filter water, how to use a compass and a map and more. And, if you start your family camping early on, you will build a love for nature into the culture of your family. Related: Prepper Website Archives for Camping – CLICK HERE. Book, Podcast, Webinar – 2019 should be a year that you start learning in a new way. There are many ways to learn. Right now, you are reading an article on Prepper Website. But you could read a book, listen to a podcast or watch a webinar or Youtube video. There is value to all of these various ways of learning. I personally use podcasts more now than ever. I don’t listen to talk radio when I’m in my vehicle any longer. Instead, I just connect my phone to my truck stereo and listen to a podcast or an audiobook. I use Audible from Amazon as my goto audiobook APP. We live our lives at such a fast pace that we don’t have time to think through, reflect and really appreciate all the blessings and challenges in our lives. Taking the time to journal will cause you to be more purposeful in this area. And because preparedness can easily lend itself to doom and gloom, reflecting on our blessings is more important than ever! 1. What did I enjoy about today? 2. What would I change about today? 3. Did I make a connection with anyone today? 4. Did I make headway towards my goals? Getting and being healthy just adds to your overall quality of life. This isn’t just about losing weight, although that is a big deal. Being healthy should include mental health too! So start to watch what you eat, how you exercise and the stress that you allow in your life. Being healthy saves you money all the way around and will be another thing that doesn’t get in your way if you find yourself in an emergency situation. This is a very important but neglected thing in preparedness. An emergency binder holds copies of all your important family documents like your marriage certificate, shot records, passports, social security cards, educational records, mortgage, bank records and more. Your emergency binder should be easy to grab, just in case you have to evacuate your home in a hurry. And since you are making this copy, it is just as easy to make multiple copies and send one to a responsible family member or keep one in a safety deposit box somewhere. Think about how valuable this would have been to all of those who have had to deal with floods or fires this last year. Not only did they have to deal with the loss of their home, but they had to replace all of these important documents by standing in long government building lines. A little bit of work right now could really pay off big later! Your family is important to you! We take for granted how easy it is to communicate nowadays through cellphones and social media. But what if that wasn’t available? Would your family know how to communicate with each other? Take a little bit of time to write down important phone numbers in and out of your current area. Include numbers to first responders, doctors, etc… Then make physical copies for your family members to include in their glove boxes and backpacks. You can also make digital copies and send it to your family through email to keep. Everyone should have a set of guiding principles, a reason why they ultimately do what they do. For me, it is my faith in Jesus. In fact, my faith is one of the major reasons I am even in preparedness. Thinking it through, you will realize that the world we live in is ordered. We live on a planet that a few degrees one way or the other would cause planetary destruction. Our environments and habitats are balanced until something that shouldn’t be there upsets it. What I’m trying to say is, it is easy to just look at nature and see that someone with intelligence put it all together. But that’s not all. There is more than this world and this life. And the way you live here determines what is to come. Take a little time to examine your faith and what you believe about God. I have created a checklist that you can download with the practices listed in this article, as well as the links that were embedded. It might be a good idea to download it and put it somewhere that will help you remember to walk-through these practice this year. You will notice that the last practice ends on December 28, 2019. That leaves you with a few days to reflect on your checklist and review how you did. It will also allow you to set the goals and practices you want to work on for 2020. 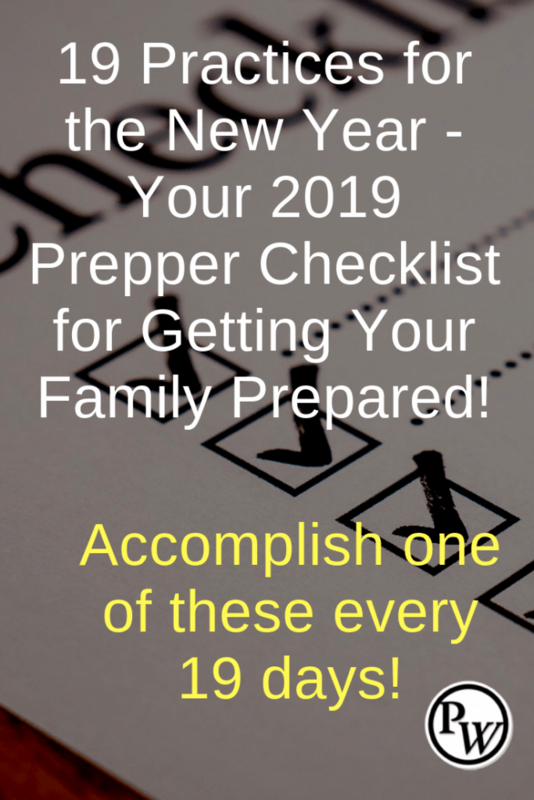 4 responses to 19 Practices for the New Year – Your 2019 Prepper Checklist for Getting Your Family Prepared! I’d look at the timing of some of your items. Waiting until July to begin a garden guarantees you will not have anything to harvest this year… switch that to April or May at the latest. What spurs most of us on is success, so if we don’t have a harvest we most likely won’t try again. Same with camping… late August is too hot, the kids are back in school, humidity and insects are awful. Early summer is much more pleasant. I’ve also made a note of it at the start of the article to clear up any misunderstandings.